But I have two major complaints about OS X’s own screenshot features, both echoed by reader comments I’ve received. First, Apple doesn’t provide a way to change the default file format for screenshots or the default location to which they’re saved; I showed you several solutions for this shortcoming last fall. Second, unlike Snapz Pro X, you can’t provide useful names for your screenshot files when each screenshot is taken; they end up saved to your hard drive as Picture 1, Picture 2, Picture 3, and so on. The answer to my second gripe can be found in Isaac Wankerl’s Sharpshooter 0.4.1 ( ; free). 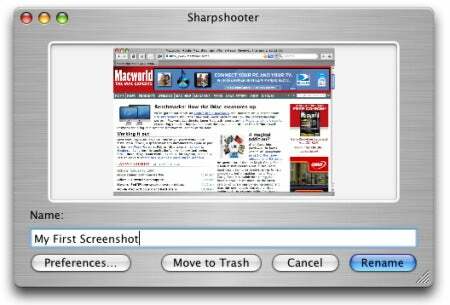 This nifty utility watches the location to which screenshots are saved; when it detects a new screenshot, Sharpshooter displays a dialog that includes a preview of the screenshot and several options. Type a new name for the file and click on Rename and the image file will immediately be renamed. Click on Cancel to keep the screenshot but use its default name. Click on Move To Trash to delete the new screenshot; this last option, combined with the in-window preview, is useful for quickly spotting and deleting obvious screenshot screw-ups. Sharpshooter is smart enough to recognize if you’ve changed the default screenshot format and destination (for example, using one of the solutions I previously provided ); it checks OS X’s settings for the proper folder and file type to monitor. (Note that if you change these system settings while Sharpshooter is running, you’ll need to quit and relaunch Sharpshooter for it to recognize the changes.) I’ve also found that Sharpshooter doesn’t interfere with other screenshot apps. For example, I have my Mac set up so both Mac OS X screenshots and Snapz Pro X screenshots are saved, in TIFF format, to the same folder. Yet Sharpshooter doesn’t attempt to rename screenshots taken using Snapz Pro X. On the other hand, Sharpshooter currently supports only image files with the following filename extensions: .jpeg, .jpg, .pdf, .png, .tif, and .tiff. I also occasionally experienced an issue where Sharpshooter wouldn’t recognize new screenshots; quitting and relaunching it would fix the issue. Finally, Sharpshooter’s dialogs don’t stay on top of other windows, and there’s no menu command to bring its windows to the front; if you switch to another application before choosing what to do with a new screenshot, you’ll have to hide other applications, or use Exposé, to find Sharpshooter’s naming dialog again. But overall, Sharpshooter is a handy tool that works well. I’ve got it running on my Macs for those times when I use OS X’s own screenshot features. 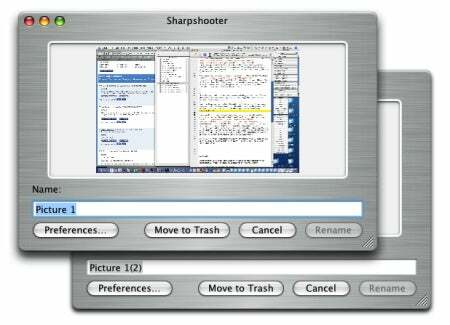 Sharpshooter 0.4.1 is a Universal binary and requires Mac OS X 10.4 or later.